Florida Marine Construction and its employees are celebrating 28 years of operation and reflecting on its past while looking to its future. Although much has changed since our first marina project in 1989, Florida Marine Construction has maintained the same principle throughout its 28 year history: bring to each project a commitment to utilizing proven technology and proper construction, to adopting strict quality control measures, and to conducting all transactions with a level of professionalism that is unrivalled. A quarter of a century and nearly 1000 berths later those same commitments remain the foundation of the company’s success. Life cycle efficiency is a business approach that aims to improve our clients’ productivity and maximise the reliability and lifetime of our installations. Florida Marine Construction provides professional services for the various stages of a marina life cycle. Our range of services covers every stage, from early conceptual sketches and marina optimisation engineering to complete turnkey marina projects and after sales services. Our expertise is increasingly called upon to solve modernisation and remodelling issues at existing marinas. 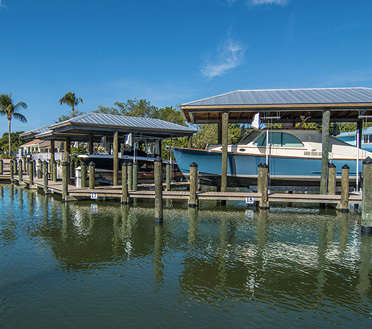 Absolutely perfect small boat marina for North Captiva Island Club. New state of the Art 26 slip marina with associated Boat Houses. 32 foot Hinckley with 20,000lbs. Boat house Lift. Aerial View of Completed North Captiva Island Club Marina. Aluminum Floating Dock Staging for 130 slip marina in Fort Myers Beach Florida. Cayo Costa State Park concrete floating ferry terminal. Innovative Lap pool within floating dock facility with amenities. Drone view of Bayside Marina under construction on Captiva Island. Florida Marine Construction installing 50 foot ICP Pipe pilings for Snook Bight Marina. Florida Marine Construction erecting steel sheet piling wall for D.O.T. road project. Florida Marine Construction installing 55 foot concrete anchor piling for floating docks in Naples, Florida.